Posted on August 29, 2018 at 9:30 pm. Consider this your laypersons breakdown on the current Flu Season Stats: Hot to Press 2018. The Brisbane Ekka Show has happened and we are now in the midst of peak Flu season. Large crowds, in Winter particularly, are always a cesspit of viral interaction. It’s like a virus conference (only they get free entry!) where they mingle at the dagwood dog stand and go hunting for their next take-home host. Illness presentations to doctors have been starting to climb but what does the local Gold Coast Public Health report have to say about it all? Every week the Unit updates the stats that include positive swab and blood testing for Flu, and hospital admissions for it (public hospitals only). It is our insight into the public health issue that the Flu is released in real time weekly reporting. 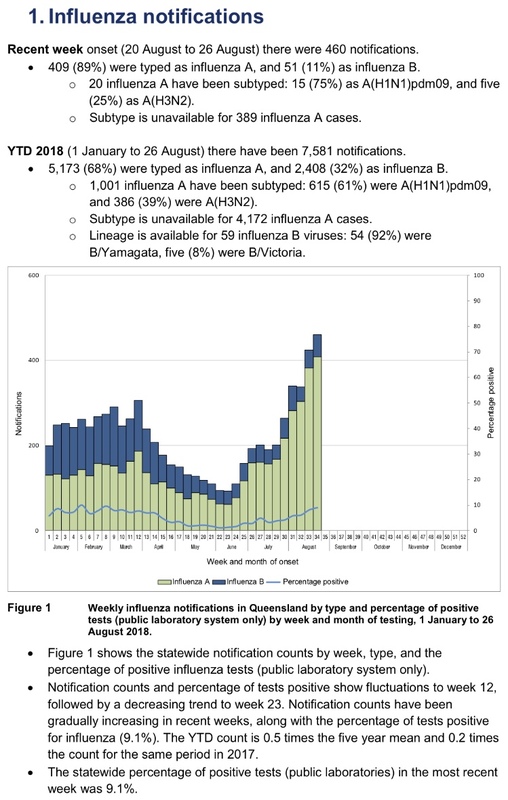 We don’t really need to go into the fine print (unless you want to be a complete flu geek like us, then checkout: https://www.health.qld.gov.au/__data/assets/pdf_file/0033/707649/influenza-qld-2018.pdf ) but at an eye shot you get the drift. The bar graphs below are heating up and getting fever steamy in these last few months following an April through June dip in positive Flu cases. 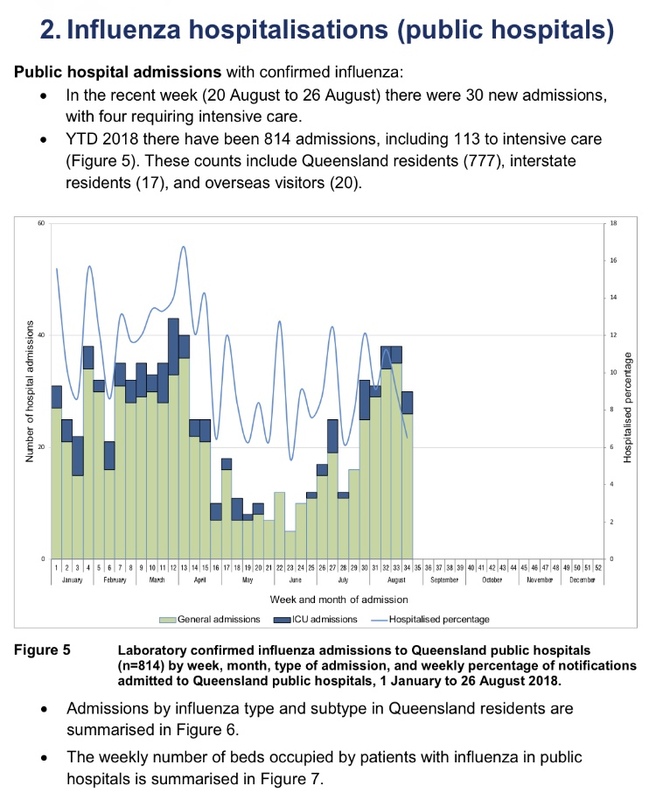 The second graph is a similar trend only this shows the admissions to hospital from Influenza. Public Health or Health of the Public: Who is getting sick? 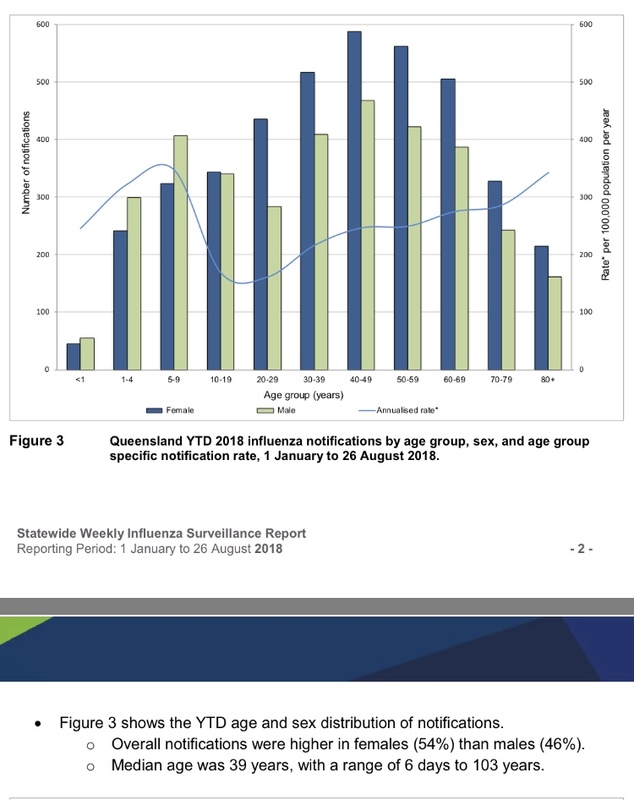 A really interesting breakdown is age categories for positive Influenza cases and it is a sad tale that signals a whop of medical certificates (Figure 3). Pay your taxes a privilege to churn through sick leave. The largest bar in the graph (Figure 3) above constitutes our middle aged tax-payers. This harks to the role of preventative programs such as Flu Shots through workplace mobile pop-up clinics. There is no cure once Flu is caught; only rest and strepsils. Most contagiousness abates after being unwell for 7 days. What a way to churn through that sick leave in one hit!? What else is making us sick (aside from going to work)? Figure 4 below does remind us gently that Winter hosts a good cocktail of illnesses that are not all “The Flu”. The other viruses listed below (*that do not have their own immunisations) are prevalent in this chilly season, but by far Influenza remains highest in numbers. Keep in mind this data is coming from Public Hospital Pathology Labs in Queensland and numbers may not represent the true correlation to the wider community. 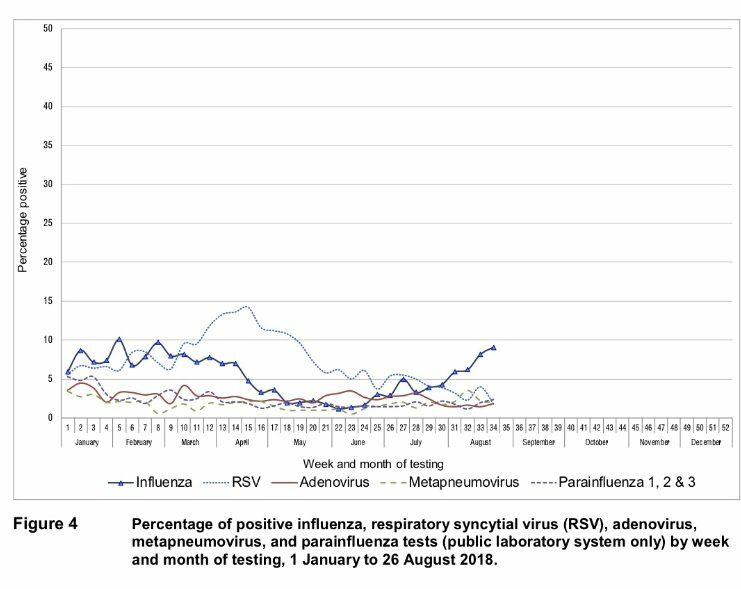 It does perhaps indirectly reflect that positive cases of Flu are higher because those people are getting unwell enough to land a spot in hospital in the first place (to have their test taken in there). Not all that sniffles is only ‘The Flu’. So do you go to work tomorrow? Well it’s a risky space right now then isn’t it!? But let’s not forget we may be just as vulnerable picking up germs from the brightest apple in the bunch at Woolies after someone has sneezed over the top of them 3 minutes earlier. So what hope do we all really have unless we Click & Collect and manage to get paid to Netflix binge at home? If this whole concept is striking paranoia into your racing heart (which could be an early fever sign by the way) then please take a moment to relax and know there is a helpful option which evidence supports. The Flu Shot. We at VirtueVax want the stress taken out of your grocery shopping each winter and offer Doctor confidence at our pop-up flu clinics to you. We are local Gold Coast based Doctors that are present at each mobile flu service. If your workplace could use more than Glen 20 right now, don’t hesitate to reach out and inquire. We have flexible payment options from ‘Boss Shouts’ to eftpos-employee strategies. It is never too late to prevent the not-so-impossible. Feel free to touch base on our website form (click here), or call us today 1300 884 729. We are also available to answer questions directly through email: [email protected] .